New digital marketing tools are constantly popping up — it can be just as exciting as overwhelming. As a digital strategy agency, we spend a fair bit of time looking into different digital marketing tools for our clients and ourselves. And as an agnostic tool selector, this means we do our research well to match client’s needs with a tool’s capabilities. Here’s seven of the most interesting, affordable, and awesome digital marketing tools we’ve recently recommended. We’ve seen live chat dramatically increase the amount of leads and feedback that companies receive. Here’s a really great case study from one founder who reckons 60% of their revenue is attributable to using Intercom. If you have a high-value product that is tricky to explain, or simply want to start more conversations with your potential customers, Intercom is a great solution to check out. Get more from your digital advertising spend. Building one-off landing pages can be a drain on your design and engineering team. But the fact remains, sometimes you need a landing page, and you need it quick. Instapage is a dead-simple landing page creator with surprisingly good templates and easy-enough drag and drop style design. You should be able to build the bones of your landing page in a couple minutes, and substitute in your brand’s colours, fonts, and tone-of-voice. It won’t be as perfect as your in-house designer, but for a temporary landing page, that’s a trade-off you should probably be willing to make. Hello Bar helps you improve the effectiveness of your website. When you have a campaign/offer/promotion that’s so important you want ALL YOUR WEBSITE VISITORS TO SEE IT, Hello Bar makes it possible. You can choose an alert bar, pop-up, or full screen takeover. Hello Bar is simple to install and edit, and a really effective way of driving traffic to offers on your website. With much power (to interrupt) comes much responsibility, so use it wisely. hellobar.com Free version available. Paid plans from $15/month. See every mouse movement, scroll, click, and keypress on your site. You never need to wonder how visitors are using your site again. 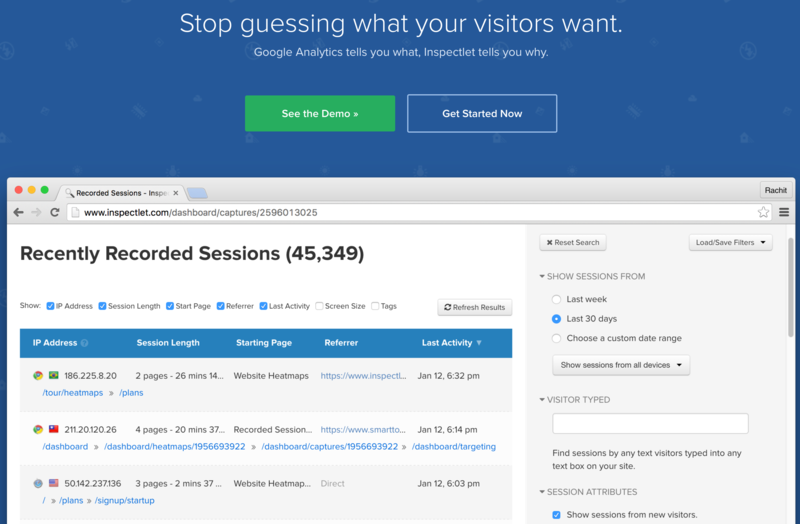 Inspectlet is a tool that allows you to watch and play-back videos of your users’ website sessions. It records every click, scroll, and mouse movement so you can more deeply understand how people actually use your website or app. Used by companies like Shopify, eBay, and WordPress, Inspectlet makes over-the-shoulder UX testing an instant and actual thing. Inspectlet can also be a powerful tool for sharing specific examples of how people use (or rage click!) your website. Sometimes a clear video example that highlights a user need is the perfect way to get buy-in from your team. inspectlet.com Free version available. Paid plans from $39/month. Connect your apps and automate workflows. Easy automation for busy people. Zapier is a super easy way to automate tasks between apps. Instead of logging a ticket with your engineering team to build an integration, you can use Zapier to integrate different systems. That’s a really simple case; Zapier can be used for monitoring and connecting systems that you didn’t know were possible. zapier.com Free version available. Paid plans from $20 USD/month. Real-time data visualisations are what set NUVI apart. Beautiful, insightful, data-driven designs will fuel your strategy and guide your decision-making process. Nuvi is a social media monitoring platform that allows you to track digital conversations, measure the influence and sentiment, and quickly analyse insights. We often use Nuvi to show clients what Australian or global conversions are happening related to their product, services, competitors, or industry. Nuvi helps your digital team stay strategic when you’re listening to social conversations and not overreact to a single post. It doesn’t offer all the features as Salesforce’s expensive Radian6, but at the price point it does well enough. nuvi.com Price by negotiation, demo available. Create, save and deploy completely dynamic groups of your customers based on their attributes and actions. Vero helps you set up email journeys which can be customised based on your user’s interaction with your app or website. Like most event-based platforms, you will need a developer to help with the integration, but once you’re set up, it’s an intuitive platform. Moving from email campaigns to user-based emails is an investment worth making. Ok, this tool you’ve no doubt heard of… but it’s so easy, so simple, and so important. The majority of your website visitors are likely from a mobile device, so you should take 5 minutes and see what Google thinks of your website. This free test will analyse your code, let you know if your site is mobile friendly, and flag any page loading issues that come up. Remember, just because your website looks pretty, that doesn’t mean it’s mobile friendly. Google Mobile Friendly Test – Free! Remember: there’s a ton of tools out there, no tool is magical enough to make all your marketing challenges go away. Don’t confuse tools for tactics, or tactics for strategy. No one likes “shiny marketing tool syndrome”—especially if you don’t follow through and report back on results. But when tools are used in the right context and with the right training—to solve an actual problem and move you forward in your marketing goals—they can make your life (and marketing) much easier.